Have you ever been on your smartphone, gone to Settings, and seen a setting option that allows you to turn Bluetooth on or off, but you don’t exactly know what Bluetooth is? Maybe you’ve also wondered if it’s similar to Wi-Fi, and if it is, then why would you need it if you’re already using Wi-Fi? If you’ve had these thoughts, you’re not alone. Even the most experienced smartphone and gadget users have probably heard the term “Bluetooth” in passing but have never actually used Bluetooth or understood what it’s used for. Bluetooth is a type of radio-wave technology that allows electronic devices to communicate with each other wirelessly over relatively short distances. As powerfully innovative as it is, what probably makes Bluetooth stand out to consumers is its unique name, the origin of which many may find intriguing but may also be unfamiliar with. The story behind the name of this technology is an interesting one. In 1996, the technology companies Ericsson, Intel, Nokia, and IBM joined forces to establish a single wireless standard, as each had been creating its own short-range radio technology. This consortium had been struggling to come up with a name for the standard until two of its engineers discussed went out for drinks in 1997 and talked about history, particularly Danish history. This led one of the engineers to look deeper into Danish history, learning about King Harald Gormsson, a king of Denmark who ruled in the 10th century. This king was nicknamed “Blåtand,” which is Danish for “Bluetooth,” which is believed to be because he had a noticeably dead tooth that appeared blue in color. Harald Bluetooth was best known for uniting warring factions in Denmark and also for introducing Christianity to the nation, which inspired the engineers to initially use “Bluetooth” as the codename for their unifying communication standard program. To sum it up, the codename stuck and ultimately became the official name of this technology. Even the Bluetooth logo pays tribute to Harold Bluetooth; it is a combination of the initials “H” and “B” in Scandinavian runes, a runic alphabet used in the 9th century. Today, Bluetooth is overseen by the Bluetooth Special Interest Group (SIG), which consists of over 30,000 member companies throughout the world in the consumer electronics, computing, networking, and telecommunications industries. What is Bluetooth Used For? Like its namesake, Bluetooth’s wireless technology serves to unify different type of entities, devices, in this case, with a communication protocol that enables them to securely connect and interact without the need for cumbersome cables or cords. Under this communication standard, devices like PCs, tablets, smartphones, digital cameras, and printers can transmit data and requests between each other to get tasks done. Through Bluetooth, pictures from a camera can be downloaded to a computer without a physical connection like a USB cord, and cell phones can relay audio from phone calls to hands-free headsets that allow drivers to make calls safely without holding a cell phone while driving. Devices interacting via Bluetooth are able to communicate through their built-in receiving and transmitting antennas that enable simultaneous sending and receiving of radio waves, which are wireless signals in the air, to each other. However, devices that do not have built-in antennas can still participate in Bluetooth communication through Bluetooth dongles or plug-in adapters, which can be in the form of USB sticks that allow a device like an old computer to make wireless connections. The radio waves sent and received via Bluetooth travel in a band consisting of 79 various frequencies centered at 2.4 GHz, which is the same frequency used by other types of wireless communication like that of cordless phones. Two Bluetooth-enabled devices connect in a process called pairing. The devices broadcast their presences to each other, so when they are close enough in distance, they automatically detect and link to each other through pairing requests, with the users on the two devices selecting the name or ID of the other device when it appears on their screens. Different types of devices can connect in pairings, so the exact steps in the pairing process can vary. For example, some devices may require a special code to be entered to ensure connections between the correct devices are made, especially if there are multiple Bluetooth-equipped devices in the vicinity. Two or more Bluetooth devices sharing information with each other create a personal area network (PAN) called a piconet, and up to eight devices can communicate at a time. In a piconet, one device is the master that controls the network, and the rest are slaves that follow the master’s directions. Two or more individual piconets can also link up in what’s called a scatternet to share data. Various device pairings in Bluetooth do not interfere with neighboring pairings because each pair uses only one of the 79 available frequencies at a time. As a matter of fact, these pairs continuously switch frequencies at thousands of times per second in order to minimize interference and provide extra security. Bluetooth-connected devices in a home also do not interfere with devices operating on frequencies of different ranges like medical equipment because the Bluetooth devices cannot transmit signals at far distances. This also helps keep the devices outside of the reach of distant cyber attackers and more secure than they would be on long-distance wireless networks like Wi-Fi. It is the power of the transmitter antenna inside a Bluetooth device that determines which of the three distance categories the device falls into Class 1 devices can function in distances up to 330 feet (100 m), Class 2 devices, which are the most common, can work over distances of up 33 feet (10 m), and Class 3 devices can only communicate over 3.3-foot (1 m) spans. Even though wireless connections are less safe than wired connections, Bluetooth is generally considered to be a secure form of wireless technology when used cautiously. Again, by being able to operate only over limited distances, Bluetooth-connected devices are kept from being within communication range of the millions of cyber thieves they would be vulnerable to if they were on another type of network. In addition, connected devices constantly change frequencies as mentioned earlier, making interception difficult. Furthermore, the wireless connections are encrypted, which can also deter cyber intruders. In addition, devices like smartphones that are designed with Bluetooth functionality come with security features that help users take control over their wireless safety. With what’s called device-level security, users can restrict Bluetooth connection on their devices only to other specific devices that they trust. Users can also take advantage of available service-level settings that let them decide what kinds of activities they will permit their devices to perform when linked in Bluetooth connections. Despite these effective safety features, clever hackers still find ways to infiltrate Bluetooth networks and put devices at risk. In bluebugging, attackers seize control and function of Bluetooth devices like mobile phones without the user’s knowledge. Bluejacking takes place when unsolicited messages, usually advertisements, are sent to Bluetooth-connected devices. Bluesnarfing is another type of Bluetooth attack in which a hacker steals data on a victim’s device like contacts or text messages by obtaining unauthorized access to the device. Bluetooth is often confused with Wi-Fi, but they are actually two different technologies. 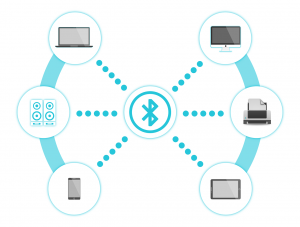 Bluetooth is designed to connect nearby electronic devices and gadgets over short distances wirelessly, typically for temporary communication of relatively limited amounts of information. Bluetooth communication uses very little power, enables automatic connection between devices, and again, is considered generally secure due to its distance restrictions and repeated frequency shifts. Wi-Fi networks, on the other hand, provide a medium of communication of large amounts of data between devices and the Internet over long distances. While Bluetooth is primarily a device-to-device technology that requires a direct pairing process for gadgets to communicate, Wi-Fi creates a centrally-sourced network through a device like a router or a modem that radiates wireless signals that other devices within range can detect to join the network. Once on a common Wi-Fi network, devices can not only connect to the Internet but can also correspond with each other to send data. Because of its significantly greater reach, Wi-Fi, even with security measures like data encryption, is more vulnerable to cyber threats. Wi-Fi networks and the devices connected to them are exposed to interceptive dangers like man-in-the-middle (MITM) attacks and key reinstallation attacks (KRACK). Because they are completely distinct and separate, Bluetooth and Wi-Fi can be used at the same time.